Wash toor dal and soak in a water for about 1/2 hour. 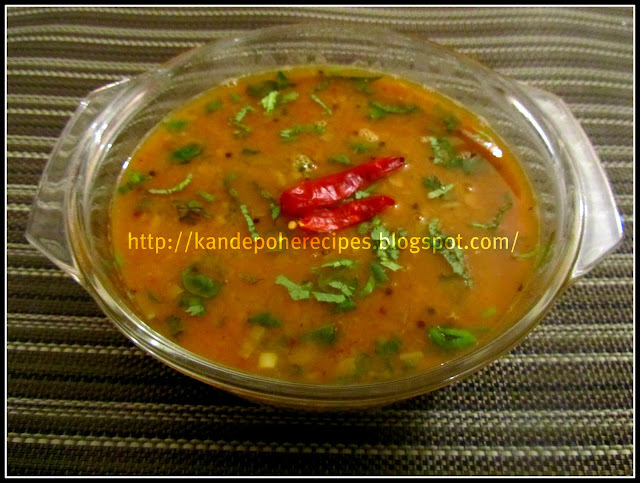 Drain out the excess water from dal and add in to pressure cooker. Add 2 cups of water, turmeric powder and salt to taste. Cook the dal until 4 whistles. When all pressure goes away, open the lid. Mash the dal little bit. Now, add red chili powder, goda masala, grated jaggery and tamarind pulp. Mix this really well and keep it aside. Heat oil in a pan. Add mustard seeds, cumin seeds, pinch of asafoetida and curry leaves. Let them crackle. Add garlic and saute for few seconds. When garlic turns slight brown in color, add cooked dal to it. Mix well and let it boil. It will take around 5-6 minutes. Add chopped cilantro and serve this ambat varan hot with plain rice. Wud like to have it with some rice..